How sensible am I, starting my journey back to Reading? Across the next hour I called and consulted with multiple friends. The phone network was often too busy to connect my calls. Despite the presense of many car drivers I felt very alone. My calm sensible friends and I agreed that I needed to get off the road quickly and get shelter for the night. wendy: do you have any spare rooms for the night? receptionist: we have one room left, would you like a toothbrush with that? Handsome Other Guest (HOG): we’re stranded too, I’ve only got a hammer and some ski poles in the boot of my car, maybe we can do a deal over the toothbrush? 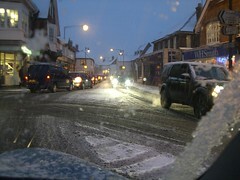 Clearly the snow car chaos called for some serious parking-up and a pint of Butcombe. My party for one joined a few other party’s for one and we all shared stories of family, cars, hills, walking, the IT industry and other topical faerie tales. * the exceptional Number 17 bus was still on the move, albeit erratically. This scribble was published on Wednesday, December 23rd, 2009. You can follow any banter on this scribble with the RSS 2.0 feed. You can share your inspired musings after typing the anti spam word near the bottom of the page. But no Pinging because its too naughty. Just so long as you were safe. We’ve had it relatively lucky, though the driving’s not been clever because we’ve an overabundance of idiot drivers at the best of times. Strangely, all the trains have been on time. I love it when it snows in the UK because it’s hilarious to watch everything grind to a halt for the sake of a smattering of snow. 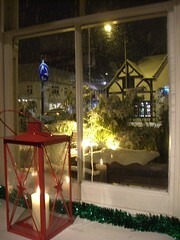 I live in Norway now, the land where everything still runs as usual no matter how many inches of snow fall. Happy Christmas Wendy and thanks for keeping us entertained!